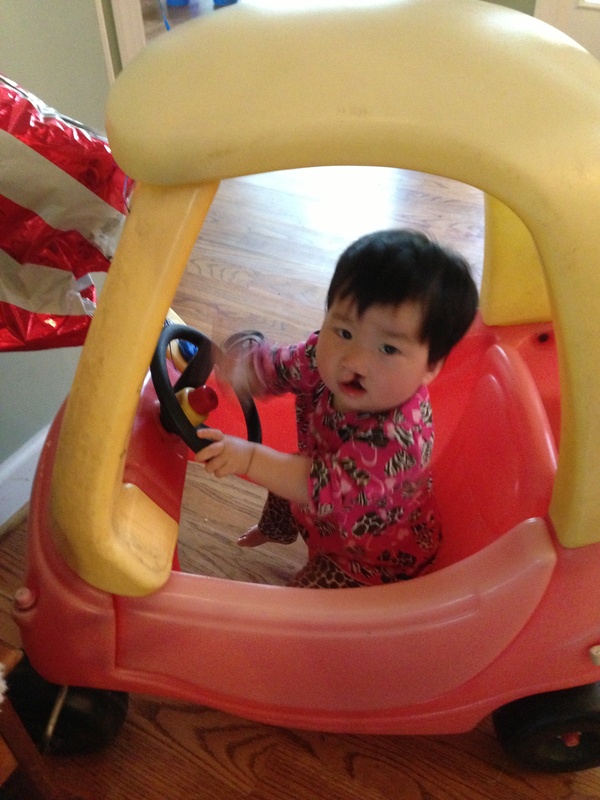 We knew when we adopted Maggie that she had these medical needs which would require several surgeries. And we loved her long before we got to China. But somehow, for me, those two things were in separate categories in my mind. 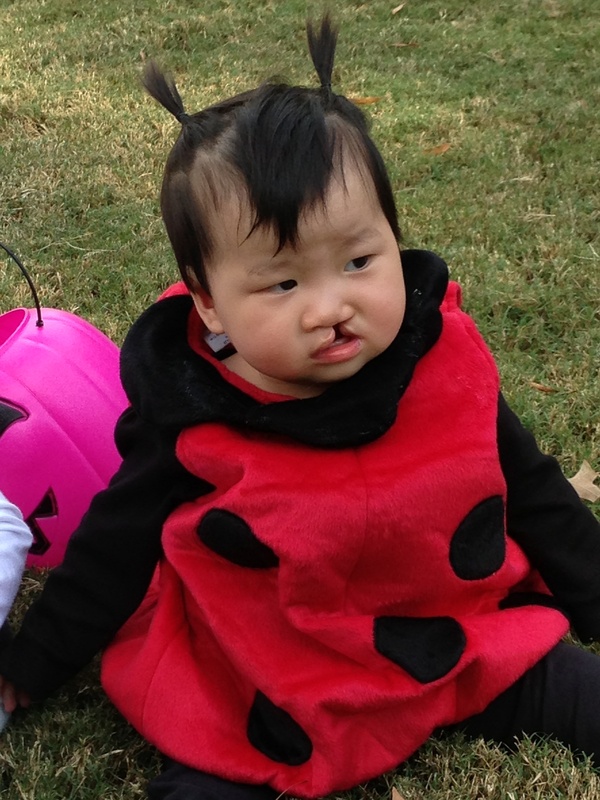 In October when we had our first appointment at the cleft clinic I felt overwhelmed with emotions as I thought about my precious daughter having to go through so many painful surgeries, each involving weeks of recovery. I love her so much and it will be really hard when it comes time for surgery. 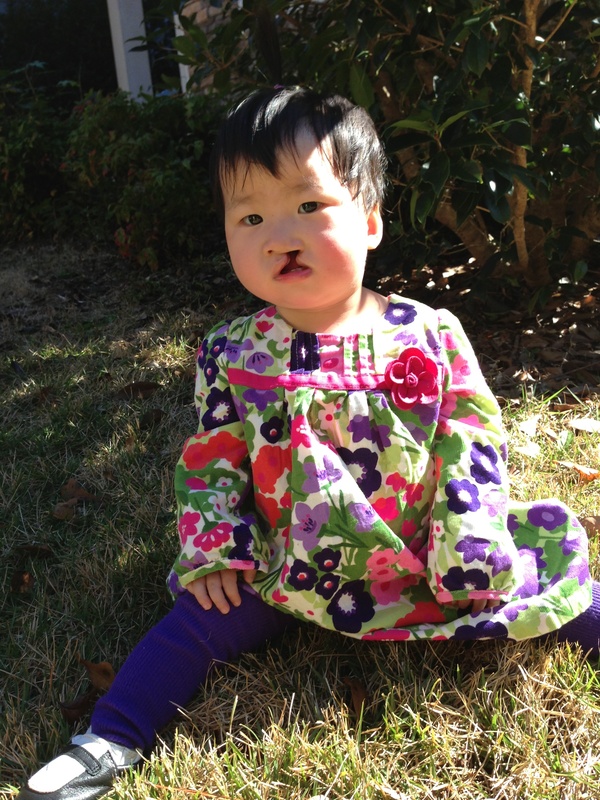 This is part of the cost of special needs adoption–not the financial cost of her medical care, but the emotional toll of seeing your baby in pain. 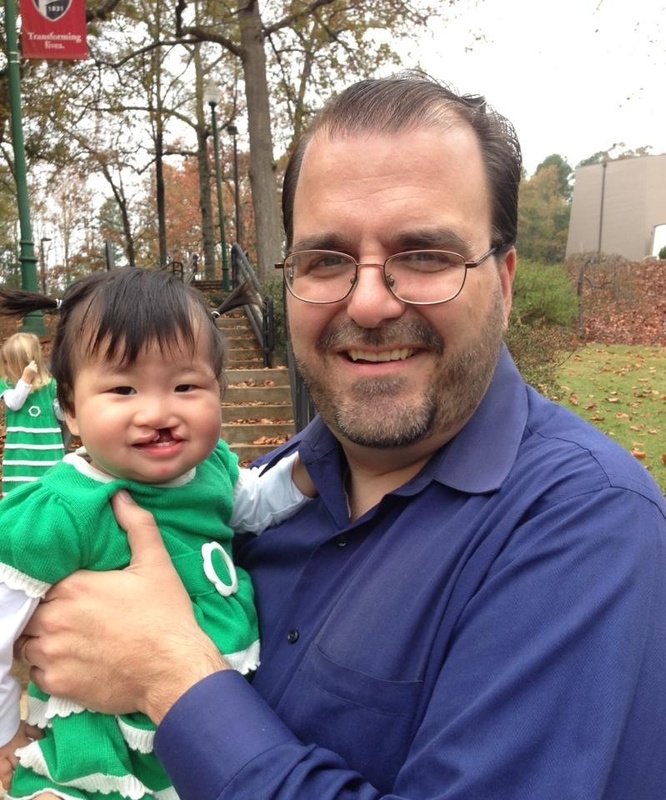 When we were thinking about which special needs our family could handle I wasn’t sure about cleft lip and palate, since I knew it would be so painful to watch a child go through so many surgeries and that the years of speech therapy and orthodontic care would add another layer to our already busy lives. But when we got her referral, we knew she was the child God had for us, and that this was the path He had chosen for us. At our pre-op appointment last week the surgeon said her surgery should take around 3 hours. They will repair her lip and nose, put tubes in her ears, and test her hearing nerve while she is under anesthesia since she failed her hearing screening at her first appointment. After surgery she will have some dietary restrictions, and she will need to be in arm restraints for several days to keep her from harming her stitches. She will be staying overnight for at least one night and then released once she shows she is managing the pain and able to drink fluids. 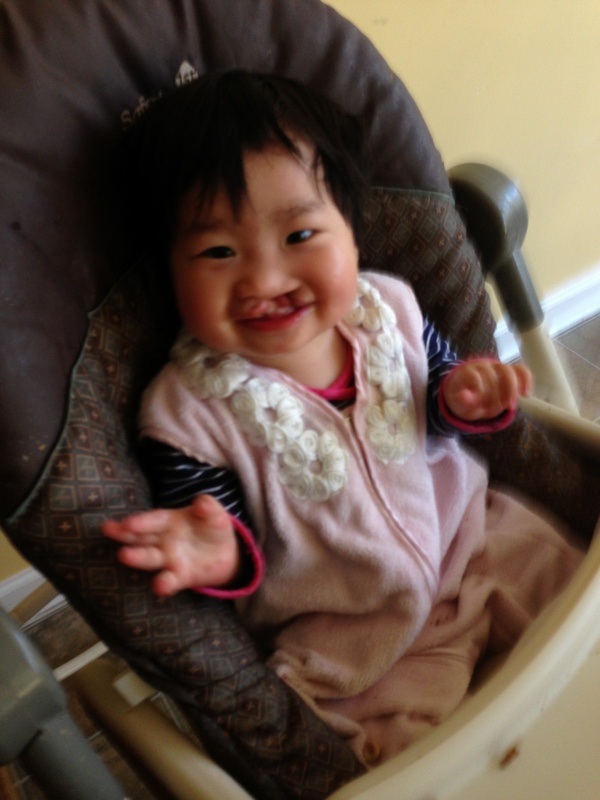 Please pray that she remains healthy before surgery, and specifically for her surgery and recovery to go well. It is scheduled for December 9th! As of yesterday we have been home for eight weeks. 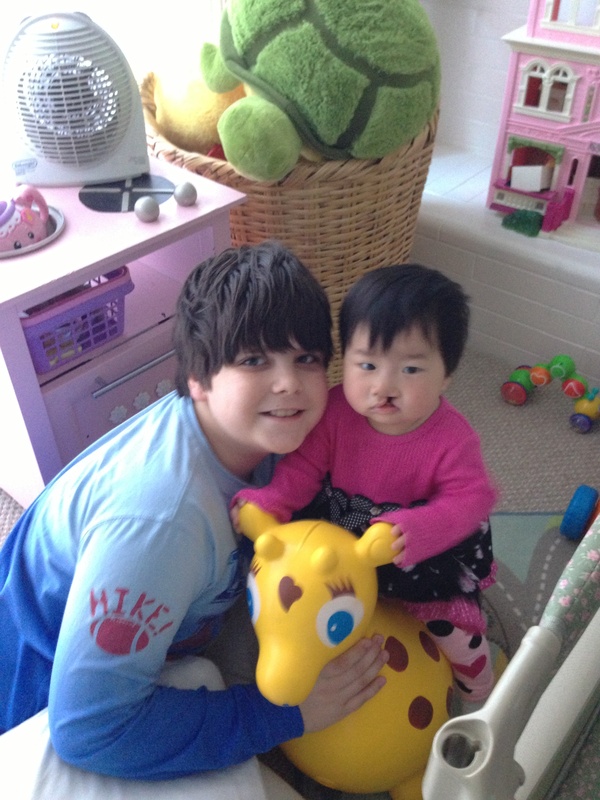 Maggie’s bonding and attachment are going so well, far better than we expected or even hoped! 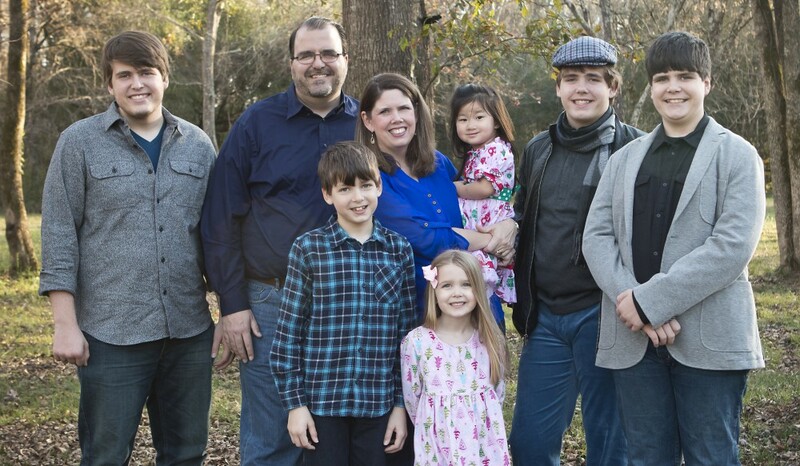 We are so thankful to the Lord that she has adjusted to our family so seamlessly. In the past two weeks we have seen her attachment grow even stronger. 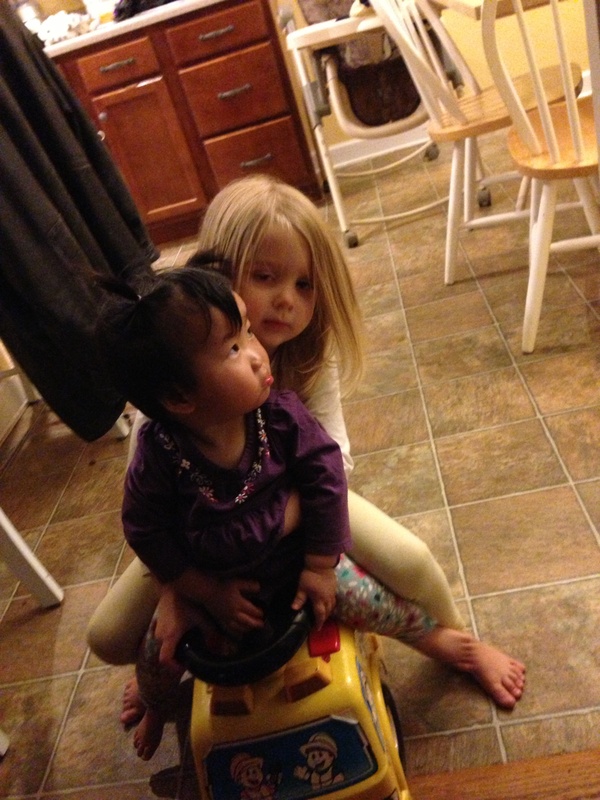 She now shows a strong preference for mommy, just as all my biological kids did at this age. She is usually willing to be with daddy or one of her brothers, but she follows mommy with her eyes, and sometimes she even cries for a minute when she realizes mommy is leaving the room. It is all very healthy and normal! The more she has attached to mommy, the less she has wanted to sleep. She is often unwilling to stop playing long enough to go to sleep, even when she is clearly tired. Mommy has become so stimulating for her that if she wakes up in the night–which she has been doing frequently in our room–she doesn’t want to go back to sleep. Instead, she protests until she is taken out into the living room or kitchen, where she becomes gleeful and playful. This isn’t a big deal at 11 pm when I am still awake, but it has happened at 2 in the morning more times than I can count. If I make a move to rock her or sit down on my bed, she cries and thrashes about–if I take her back out of my room, she instantly turns off the waterworks. For this reason we decided to move her out of our room and into her own room this week–and it has been wonderful for everyone! She is sleeping through the night again (four out of the last five nights), whereas in the last week or two she was spending more and more time awake during the night. One time this week she did wake up in the night three times, but I was able to comfort her and lay her back down–when she was in my room that had become impossible. She refused to be laid back down without a huge fuss. Yet she couldn’t fall asleep in my arms either, as all she wanted to do was play with me. I am still having trouble getting her to fall asleep in the first place. She can fall asleep in my arms while she is drinking her bottle, but she instantly wakes up when I lay her down and she doesn’t want to fall back to sleep. She also doesn’t do well when I lay her down awake. I am convinced she is neither grieving nor fearful that I won’t return. She is behaving just like my other kids did when they preferred to hang out with mommy instead of going to sleep. We are going to be working on this in the coming days, as up til now we have been letting her dictate her schedule. With baby in control, she is often staying up til 10:30 or 11:00 at night, and refusing to nap at all. She is definitely over-tired, and so are we! 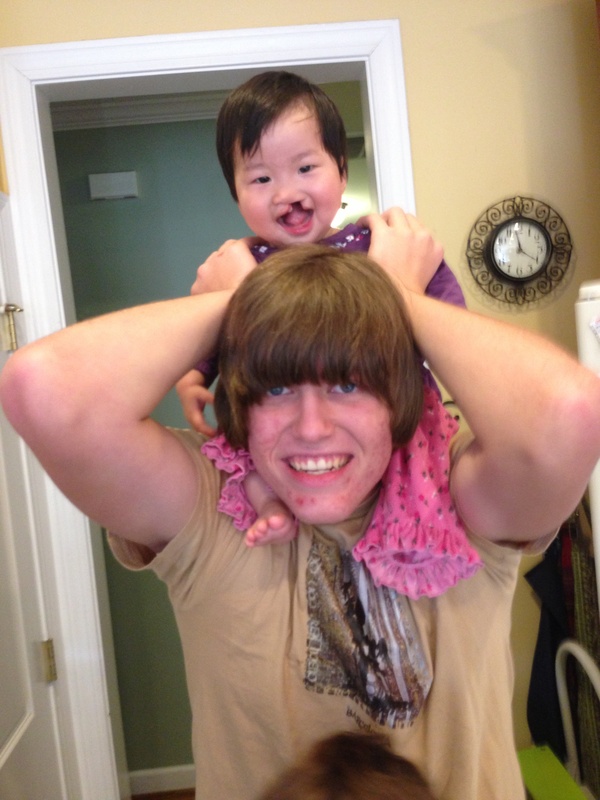 The adoption clinic had told us we should not let her cry for more than 30 seconds for the first three months. That was all well and good the first month, when her cries often meant that she was checking to make sure I was still there. As soon as I picked her up she was comforted and fell right back to sleep. But now (after ten weeks with us) she has learned that if she cries for even one minute someone will get her up and she can continue playing–so she never lays down without putting up a fuss, and we end up repeating a vicious cycle all night long until she is just too tired to hold out any more. The past two days we have let her fuss a little longer than 30 seconds at nap time and at night, and each time she has been fast asleep in less than five minutes. She has woken up happy and refreshed. 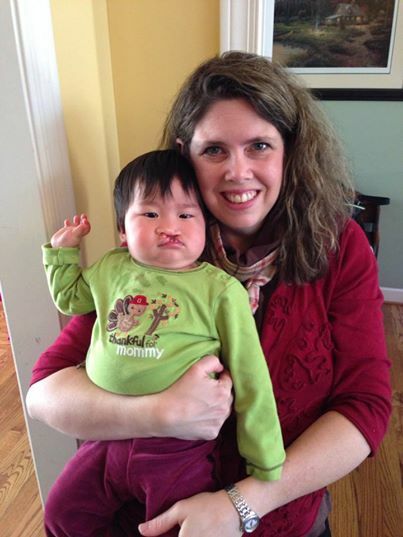 This week we headed back to Birmingham for a follow up session with the occupational therapist at the adoption clinic and a pre-op appointment at the cleft clinic. 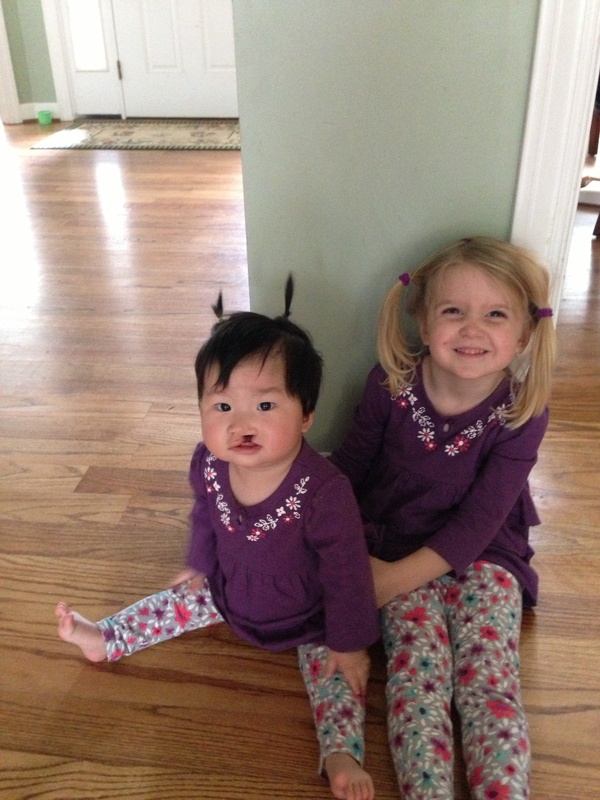 We could certainly get OT services where we live but the adoption clinic suggested it is better for Maggie to see their occupational therapist for now, since she is familiar with the problems particular to institutionalized children. If have been a little discouraged as sometimes it seems like Maggie made tremendous progress her first month with us and then kind of plateaued her second month. 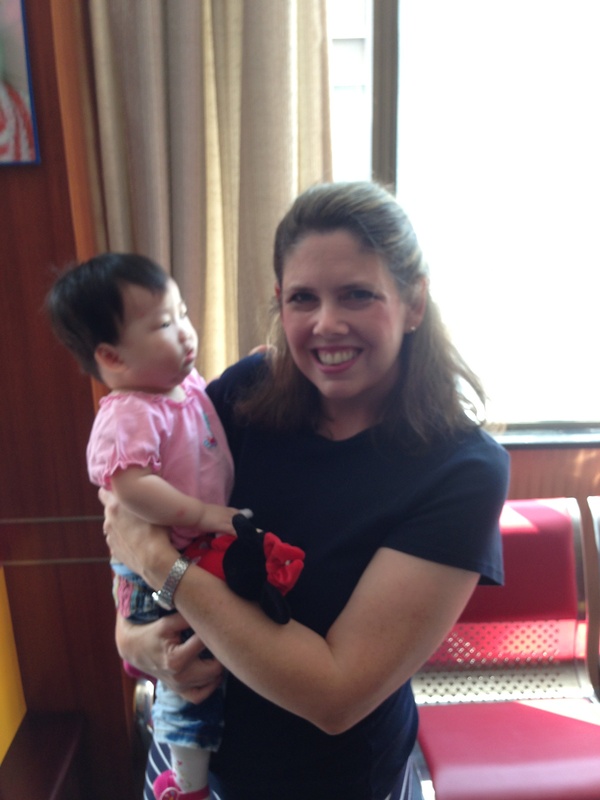 It was encouraging to meet with the OT and see just how far she has truly come in such a short span of time. Even though some of her progress isn’t flashy she is definitely making strides. 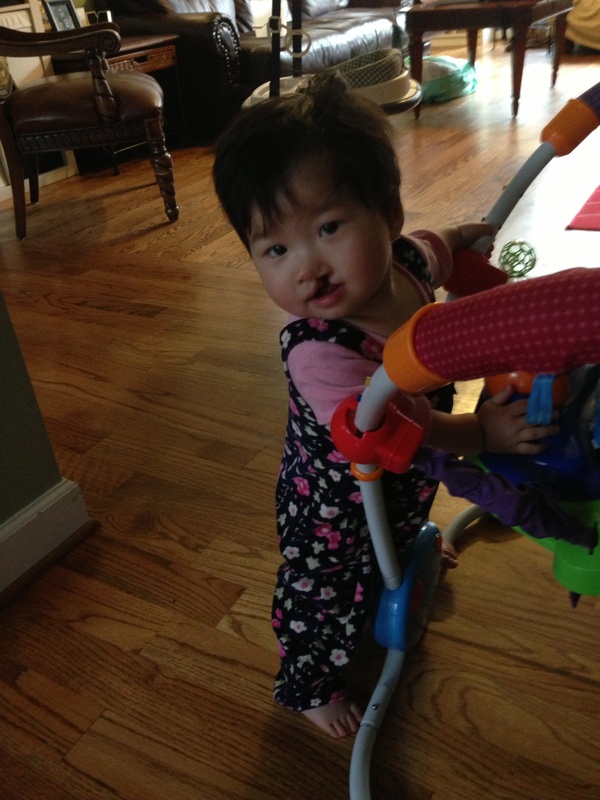 She is so much stronger than she was two months ago and the OT was pleased with how she is coming along. Maggie is bearing more weight on her legs, and for longer periods of time. She can’t pull up to stand yet, but she can remain in a standing position for quite awhile if I help her to get there. She is army crawling and scooting more and more, whereas she used to never move from where she was placed. She is getting increasingly better at fine motor skills such as self-feeding–so good, in fact, that now I really have to be careful that the floor has been well swept before I put her down! The OT gave me many more exercises that I can do with her, and we will try to meet again in January to see how she is doing. I am writing this post one week after seeing the OT and Maggie has already made progress on the skills she gave us. She is still in the stage of not being happy to do any of what we are working on, but she is tolerating it a little better and a little longer each day, and getting into her positions faster when I put her through her paces. We are working on teaching her to use her stomach muscles to go from lying down to sitting up, and helping her to practice getting from a sitting position onto her knees, as well as how to sit in a crawling position and bearing weight on just one hand while the other hand reaches for a toy. She is spending more time each day in her hip helper pants which force her to keep her legs closer together and use her stomach muscles more. 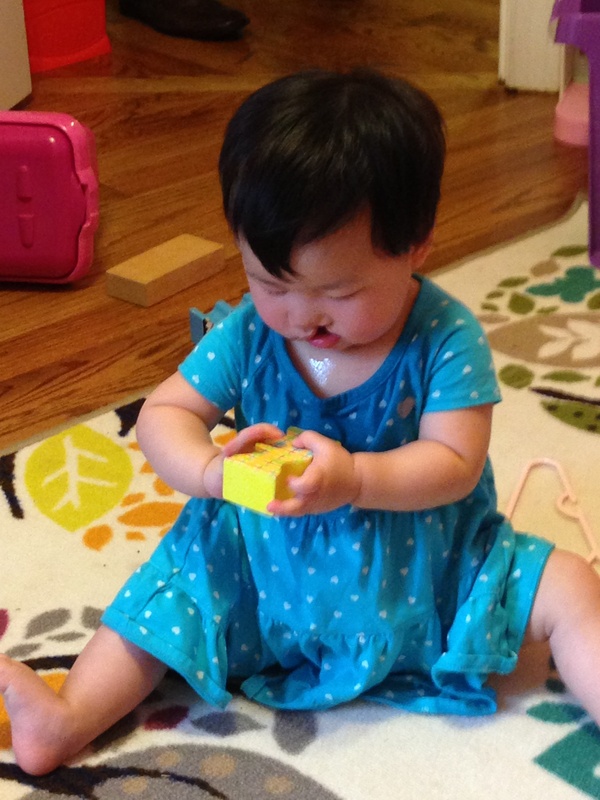 She is very comfortable sitting up and playing right in front of her, but she needs to work on turning to one side or the other and being able to play and interact in other “zones”. Often institutionalized kids move in a robotic way instead of fluidly and I see this in her often when she is playing–she needs to learn that she isn’t limited to only what is immediately in front of her. She is continuing to bounce on the yoga ball, but now we have added rolling it to either side as she sits on top of it so that she has to pull with her stomach muscles to maintain her balance. She actually really enjoys that exercise! She cried quite a bit when the OT tried to get her into various positions–she was angry! But each time she let me comfort her, snuggling into my neck and calming down right away when I picked her up. After our appointment I took Colin and Maggie shopping to get Colin some new winter clothes and then we went out for a nice dinner. We spent the night in the home of some new friends. It was fun to have some one-on-one time with Colin and he was a big help on the drive and at our appointments. 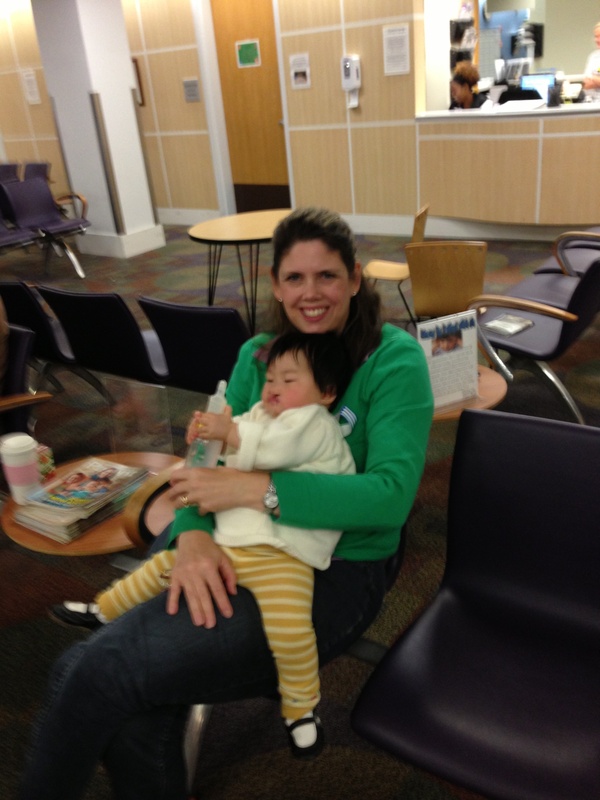 The next day we went back to UAB (University of Alabama at Birmingham) for our pre-op appointment at the cleft clinic. The last time we saw the cleft team everything went smoothly and quickly, giving me the impression that they were very fast and efficient. That was hardly the case this time, as it took them over two hours to even get us into a room, and another two hours to talk to the various doctors and complete the paperwork for pre-op. Maggie is scheduled for surgery on December 9th. We plan to put her under “quarantine” starting about the first of December in hopes of keeping her healthy for surgery. It may be hard to keep germs out of our house with all our other kids coming and going, but we are going to try. If Maggie gets sick and can’t have her surgery it will be postponed until sometime in the new year–and we’d like to avoid that. After Maggie’s appointment was over we made the 3 hour drive back home. Maggie slept most of the way and Colin helped when she was awake. He gave her a bottle in the car–it was the first time anyone other than David or I have fed her. Her bonding and attachment is going very, very well and desperate times call for desperate measures. Maggie was so happy to come back home! It was clear that she knew her family and was so excited to see them. She couldn’t stop smiling, kicking her legs, flailing her arms, and vocalizing her joy. Everyone greeted her but once they moved on she would try to get their attention again and seek to get them to make eye contact. This trip was very encouraging from a bonding standpoint as there were many opportunities to see how far she has come. We have had Maggie for two months now. The difference between the little girl placed in my arms on Gotcha day and our little Maggie today is amazing. Better nutrition and more calories are causing her tummy to pudge up and her face to fill out. 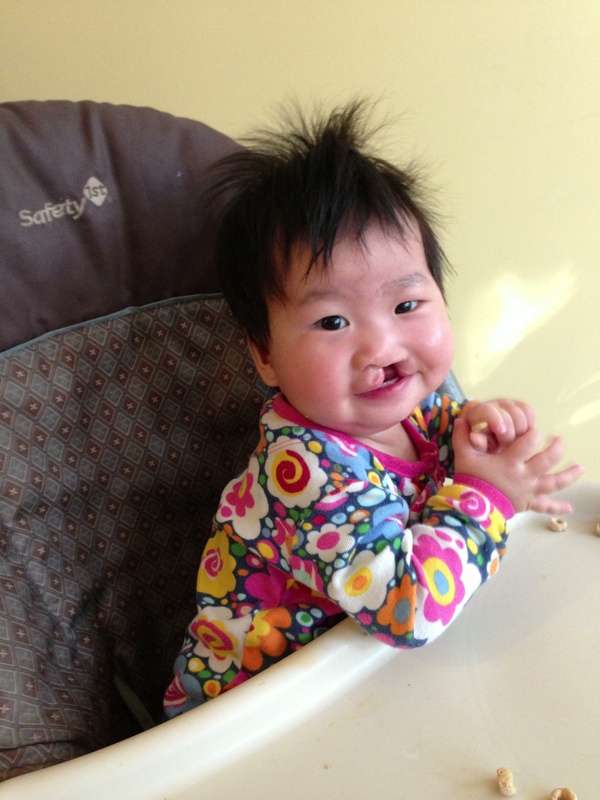 After 14 months without a single tooth she now has four teeth and more on the way. Her hair is getting thick and glossy. After bouncing for several minutes a couple times a day on her yoga ball Maggie’s core muscles are getting stronger. She has started to crawl. She smiles a lot at all of us, and she is happy. She has definitely chosen mommy as her primary attachment, and shows the normal sadness that all of my babies have exhibited when they are handed off to someone other than mommy for a few minutes. She also shows the same resilience they had, settling down and having fun when she realizes that daddy or big brother is her only option at the moment, and mommy will be back soon. She still has many hurdles to overcome. Right now we are working on her core strength, and although I am no longer seeing the huge leaps and bounds that I saw during her first month with us, I still believe we are making quiet, unseen progress. She can sit on her ball longer, she likes to try and bounce herself when I stop bouncing her, and she no longer cries when put into a crawling position on her ball or on the floor. 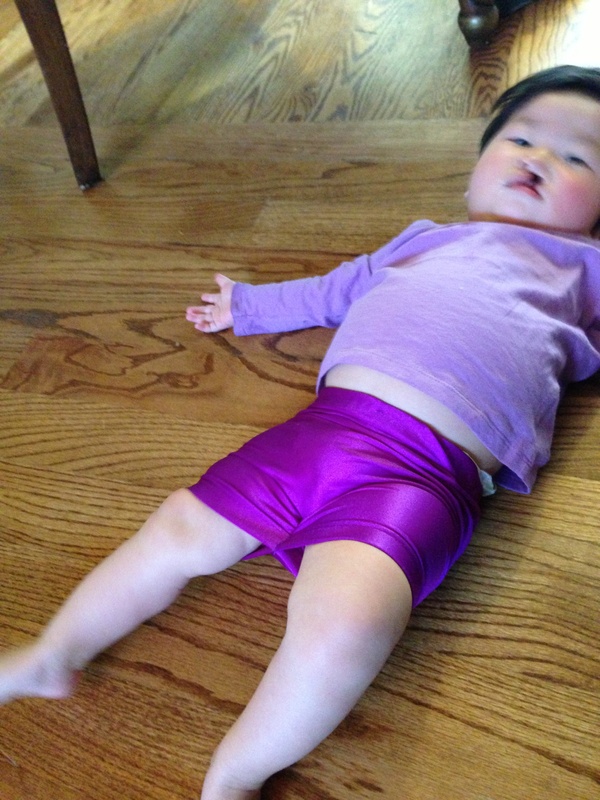 We have been using her “hip helpers” shorts for longer periods each day while she plays to force her to use her stomach muscles for support. Maggie’s hip helpers prevent her from spreading her legs too wide. When she sits up she has to use her stomach muscles more. 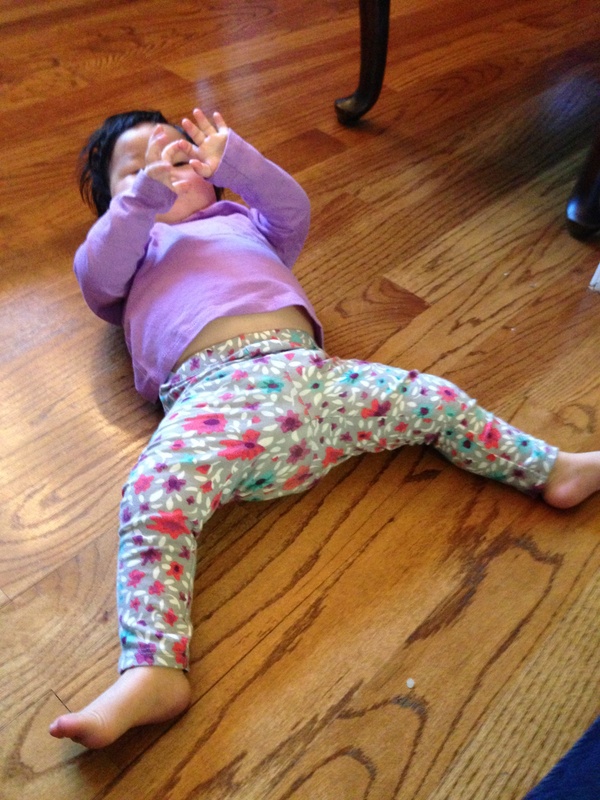 She has not learned to move well in the hip helpers yet–she can’t get into a sitting position from lying down with them on since she uses her leg muscles to help her sit up rather than her stomach muscles.